Most Americans share the perception that the Supreme Court is objective, but Erwin Chemerinsky, one of the country's leading constitutional lawyers, shows that this is nonsense and always has been. The Court is made up of fallible individuals who base decisions on their own biases. Today, the Roberts Court is promoting a conservative agenda under the guise of following a neutral methodology, but notorious decisions, such as Bush vs. Gore and Citizens United, are hardly recent exceptions. 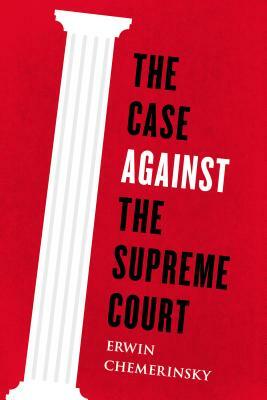 This devastating book details, case by case, how the Court has largely failed throughout American history at its most important tasks and at the most important times. Only someone of Chemerinsky's stature and breadth of knowledge could take on this controversial topic. Powerfully arguing for term limits for justices and a reassessment of the institution as a whole, The Case Against the Supreme Court is a timely and important book that will be widely read and cited for decades to come. A graduate of Harvard Law School, Erwin Chemerinsky is the founding dean and distinguished professor of law and the Raymond Pryke Professor of First Amendment Law at the University of California, Irvine School of Law, with a joint appointment in political science. He lives in Irvine.